I first read the reviews online about the Insight Series Self-Propel mowers and was struck by how many people said how easy it was for their wife or girlfriend to use the mower. It would take more than an easy to push mower to get my wife to mow the lawn but I was intrigued none the less. I've been really impressed and pleased with this mower. The Self-Propel feature does make the mower very easy to push as the natural force you put into the mower as you walk adjusts the power that is transferred to the wheels. Thus as you hit an incline the mower automatically adjusts and you're able to keep a steady pace. It really does take the effort out of mowing. The 6.5 hp Easy Start TecumsehÂ® Engine does start like a charm. It has more than enough power to tackle anything my yard will throw at it. I've never used the bag or the side discharge as the mulching system works well even when I'm a few days late getting to the mowing. One of the best features of this mower is the compact storage. The handle easily raises to both 90Â° and 180Â° storage positions (the latter allows you to hang the mower bag on the handle above the mower). I have a two car garage and this allows me to store the mower between both cars at the entrance without the handle sticking out to take up more space than is necessary. A final note, the manual recommends shooting water under the right front tire to clean the underside of the mower while the mower is running. By doing this the blade catches the water and cleans off the grass clippings stuck to the underside. Doing this is possible on any mower but I just wanted to add that it works really well. Have had this lawn mower a little over 2 years. I had started it last weekend to finish mowing my lawn. I was wheeling it out with it running to the spot to start when there was a "boom" and smoke, and I heard something hit on the sidewalk. The lawn mower had stopped on its own. There was a large hole in the right side of the engine and there were several very hot parts on the sidewalk. Almost like a car motor that shoots a rod out. Of course the mower is kaput. Have had many other makes of mowers and nothing like this has ever happened. Got this one because my last mower finally wore out. As much as I loved my 1984 Toro, I love this Lawn Boy even more.Starts everytime, gobbles up the yard very fast.Switched to an awesome Oregon premium blade.Oil changes every year, fresh fuel STILL GOING' STRONG.Lawn Boy doesn't make the inight series anymore,BIG MISTAKE. I purchased this mower as a compliment to my 1984 Key-lectric Toro mower.The Toro is great but the features of the Lawnboy plus the low price,just over $300, make this the best value/performance mower on the market.Love the sens-a-speed self propel system and simpleset handle,and the 6.5hp Tecumseh easy start engine.Yes I know this mower is a green Toro( that's another reason I bought it).YOU WILL NOT BE DISAPPOINTED WITH THIS MOWER.One complaint...my lawn is now a one beer lawn not a three beer lawn.My wife gave my sister-in -law the Toro(gasp! )since the Lawnboy is that good...oh well.. The 10685's self-propel mechanism is not a long-term design. The mower is in it's 5th season of weekly use (North Carolina) and I'm paying a service tech (again) to fix the self-propel mechanism. I'm not mowing hills or inclines, cannot believe how poorly it performs. I'll look for any brand other than Toro/Lawn Boy next. I've had this mower since 2005. It is lighter and easier to manuver but I doubt it will last as long as my previous Toro mower which laster over ten years. I usually have a problem each season with the drive belt coming off or getting jammed with small debri picked upfrom the lawn. It is also very sensitive and stalls out, being hard to start whenever the grass is just a little wet. In my area service was hard to find. A local power equipment dealer finally serviced it. Their rates were $75/hr! Right now I'm trying to fix the self-propelled drive system again and believe it or not, finding detailed help on the web is difficult. Join in and write your own page! It's easy to do. How? 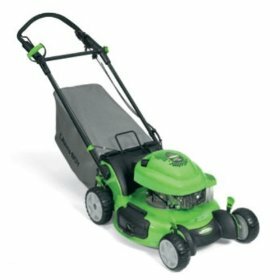 Simply click here to return to Lawn Boy Lawn Mower Consumer Reviews.